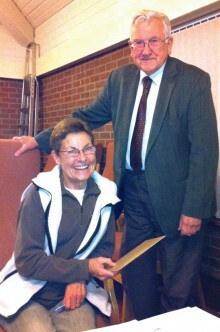 An Alvechurch resident has been recognised for her unstinting dedication to an important village charity. Dianne Court has been a Trustee of the Lewkner Homes Almshouses for 30 years, and was recently presented with a card and garden voucher by the Chairman of Trustees, Alan Ogden. The card contained a copy of Dianne’s original invitation letter from 1983, signed by Rev Leslie Aitken who was then the Chairman of Trustees and Rector of St Laurence Church. The Almshouses were set up to provide accommodation for the poor and needy people of the parish, and today the charity enables people with social and health problems to continue an independent life. The original Almshouses, or Hospital as it was first known, were established through the will of Nicholas Lewkner (sometimes spelled Lewknor) who died in 1580. Part of the income from his estate at Hadzor was to be used to finance building and to provide an endowment. The Hospital was erected in 1588 providing accommodation for a Master, six brethren and two sisters. Originally the properties were rent-free, residents also receiving a small monthly payment. In 1912 a number of charitable bequests were combined as the United Charities of Alvechurch to provide financial support, but by 1963 a shortage of funds meant that all residents had to make a weekly maintenance contribution. The original Almshouses must have been rebuilt or altered in the 18th or 19th century but by the late 1970s the dwellings were in a very poor condition. There was insufficient funding available to pay for renovation, so the charity was registered as a Housing Association in 1977 and was able to borrow funds to rebuild. The current buildings, situated behind the original Almshouses, were built in 1980 and various repairs and improvements have been carried out since. Pictured: Dianne Court and Alan Ogden.